There will be a few hours late Wednesday night and/or early Thursday where there will be a higher probability of far northern county strong to severe weather. The eastern approach of a western upper trough will place our region in a more favorable jet region for the development and sustainment of strong to severe thunderstorms. There will be a brief window of opportunity for the evolution of strong discrete storm cells that could form into a more organized line along their eastward advancement early Thursday morning. The main modes would be large hail from multi-cellular storms to damaging wind gusts if a squall line does develop. While localized hourly rain rates of between an inch and two inches could cause nuisance low land or roadway flooding, no flash flooding is expected. The Storm Prediction Center (SPC) has clipped our far northern counties with a Enhanced Outlook for severe weather from 7 AM Wednesday to 7 AM Thursday. The Slight Outlook extends southward to roughly a Columbus to Conroe to Livingston line. 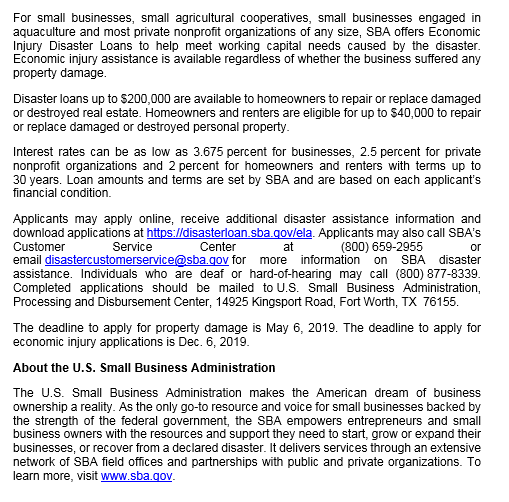 SACRAMENTO, Calif. – Small nonfarm businesses in 46 Texas counties are now eligible to apply for low-interest federal disaster loans from the U.S. Small Business Administration, announced Director Tanya N. Garfield of SBA’s Disaster Field Operations Center-West. These loans offset economic losses because of reduced revenues caused by excessive moisture and flooding in the following primary counties that occurred Sept. 3, 2018 - Jan. 28, 2019. Neighboring counties: Angelina, Archer, Baylor, Cherokee, Colorado, Crockett, Edwards, Fayette, Fort Bend, Freestone, Henderson, Jack, Jones, Kimble, King, Knox, Lee, Limestone, Menard, Milam, Montgomery, Palo Pinto, Robertson, San Jacinto, Schleicher, Shackelford, Stephens, Stonewall, Throckmorton, Trinity, Val Verde, Waller and Wharton. By law, SBA makes Economic Injury Disaster Loans available when the U.S. Secretary of Agriculture designates an agricultural disaster. The Secretary declared this disaster on March 11, 2019. The deadline to apply for economic injury is Nov. 12, 2019. If you have any questions or concerns please call the contact number listed above. The new test date is Tuesday, March 26, 2019, the times and locations remain the same. “This is a test of the Mont. Co. Wireless Emergency Alerts No action required www.mctxoem.org"
If you do not receive at a minimum the first test that targets all of Montgomery County at 10:15 AM or if you feel as though you should have received a second message, please go to www.mctxoem.org and fill out the survey. You can direct any questions or concerns to OHSEM 936-523-3900. Please note that some public will receive more than one test message in a short amount of time. We want to assure the public that this testing will not become the norm but is necessary to ensure their safety. Additional satellite offices and application intake locations will be available in each county with variable office hours to be based on need. All locations with current hours of availability will be posted on recovery.texas.gov/hrp. For additional assistance, interested applicants can email cdr@recovery.texas.gov or call 1-844-893-8937. AUSTIN - Hurricane Harvey survivors currently living in Federal Emergency Management Agency (FEMA) funded temporary housing units (THUs) who wish to remain in their units past Feb. 25, 2019, will be required to begin paying rent after that date. Households that cannot afford Fair Market Rent may have their rate reduced as low as $50 per month. Rent reduction appeals will not be accepted after Monday, Feb. 25. FEMA's temporary housing program was originally planned to run through Feb. 25, 2019. However, on Nov. 28, 2018, Commissioner George P. Bush announced FEMA granted his request for a six-month extension for Hurricane Harvey survivors still residing in federally funded manufactured housing units and travel trailers. Although the housing program has been extended through Aug. 25, 2019, those who remain in the program after Feb. 25 will be required by FEMA to pay rent. Survivors who cannot afford fair-market rent are able to petition for a reduction by contacting FEMA. Eligible households received a letter from FEMA including information about the costs related to the extension. Households that cannot afford Fair Market Rent, however, may have their rate reduced as low as $50 per month. Rent is based on the fair market rate (FMR) of comparable rental properties in the area. FEMA staff is working with survivors to determine how much rent they can afford based on their incomes and current housing expenses such as mortgage payments on their pre-disaster residence. Survivors who cannot afford the rent can petition for a rent reduction by contacting FEMA. Appeals and supporting documentation regarding rent must be returned to FEMA via postal mail, fax, or by giving the appropriate documentation to their recertification caseworker before Feb. 25, 2019. FEMA uses U.S. Department of Housing and Urban Development (HUD) guidelines to determine a homeowner's eligibility for reduced rent. HUD defines low-­income families as those with incomes not exceeding 80 percent of the median family income for the area. When FEMA approves a reduction, the rent amount is based on the THU occupant's financial ability to pay. Several factors are used to calculate rental requirements for those seeking a reduced rate, such as the household size, housing expenses and adjusted income for all adult occupants. Occupants who have questions about renting THUs can get more information and connect with a case manager by emailing femadr4332txrent@fema.dhs.gov. For additional information on Hurricane Harvey and Texas recovery, visit FEMA's Hurricane Harvey disaster web page at www.fema.gov/disaster/4332, Facebook at Facebook.com/FEMAHarvey, the FEMA Region 6 Twitter account at Twitter.com/FEMARegion6 or the Texas General Land Office website at Recovery.Texas.Gov. The Texas General Land Office (GLO), in partnership with Jasper County and local community organizations, will host a series of application fairs to assist homeowners still in need of Hurricane Harvey recovery aid. The events are designed to encourage residents to apply the Homeowner Assistance Program, which is providing more than $127 million in housing assistance to hurricane survivors across the Deep East Texas region. At each fair, application coordinators and program representatives from the program will be available to help homeowners complete a program application and answer any questions. Applications take approximately 30 minutes to complete, and homeowners are encouraged (but not required) to call 1-844-893-8937 to schedule an appointment at one of the fairs. Homeowners should review the Homeowner Assistance Program Checklist prior to applying and have required documents ready. Potential applicants from neighboring counties in the Deep East Texas Region are also encouraged to attend. Feb. 15, 4 - 7 p.m.
Feb. 16, 10 a.m. - 2 p.m.
Feb. 22, 4 - 7 p.m.
Feb. 23, 10 a.m. - 2 p.m. Homeowners in Jasper, Newton, Polk, Sabine, San Augustine, San Jacinto and Tyler Counties not able to attend one of the fairs can still apply by submitting an application online or in-person at one of the program's Homeowner Assistance Centers. The Homeowner Assistance Program is administered by the Texas General Land Office. Homeowners with questions or concerns may email cdr@recovery.texas.gov or call 1-844-893-8937. For more information, visit recovery.texas.gov/hap. Coldspring, TX, Jan. 21 - San Jacinto County, in partnership with the Texas General Land Office and local community organizations will host a series of application fairs across the County to assist homeowners still in need of Hurricane Harvey recovery aid. The events are designed to encourage residents to apply for GLO’s Texas Homeowner Assistance Program, which is providing more than $127 million in housing assistance to hurricane survivors across the Deep East Texas region. At each fair, application coordinators and program representatives from disaster recovery organizations will be available to help homeowners complete a program application for assistance and answer any questions. Applications take approximately 30 minutes to complete, and homeowners are encouraged (but not required) to call 1-844-893-8937 to schedule an appointment at one of the fairs. Homeowners should review the Homeowner Assistance Program Checklist prior to applying and have required documents ready. Individuals affected by Hurricane Harvey may qualify for assistance through the Texas Homeowner Assistance Program if they owned their home, it was damaged or destroyed by Hurricane Harvey and it was their primary residence at the time of the storm, among other eligibility factors. The program offers qualified homeowners assistance to repair, rehabilitate or rebuild homes damaged by Hurricane Harvey. Applications will be considered for award on a first come, first served basis, according to the priorities outlined in the Regional Housing Guidelines. Jan. 25, 4 - 7 p.m.
Jan. 26, 10 a.m. - 2 p.m.
Jan. 31, 4 - 7 p.m.
Feb. 1, 4 - 7 p.m.
Feb. 8, 4 - 7 p.m.
Feb. 9, 10 a.m. - 2 p.m. Homeowners in Jasper, Newton, Polk, Sabine, San Augustine, San Jacinto and Tyler Counties not able to attend one of the fairs can still apply by submitting an application online or in-person at one of the program’s Homeowner Assistance Centers. Locations and dates for the Homeowners Assistance Program Fair. On Monday, December 10, 2018 the General Land Office will open a mobile intake center in Shepherd to help homeowners who still need assistance with Harvey-damaged homes. Potential applicants should visit the Texas General Land Office website and review the Homeowner Assistance Program Checklist to have all applicable documents ready before applying. Don’t wait. Interested homeowners can visithttp://recovery.texas.gov/individuals/programs/homeowner-assistance/east-texas/index.html to apply online now or to download a printable version of the application to get started. If you have questions, please emailcdr@recovery.texas.gov or call 1-844-893-8937. Home damaged by Hurricane Harvey? 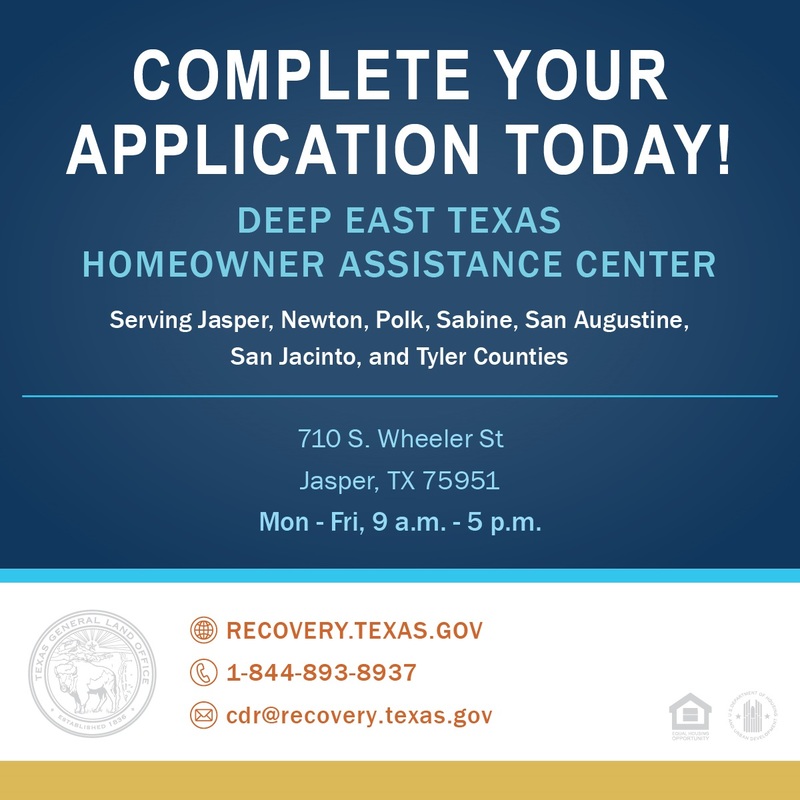 The Texas Homeowner Assistance Program Housing Assistance Center in the Deep East Texas Region is now open and assisting homeowners in completing their program application for assistance.